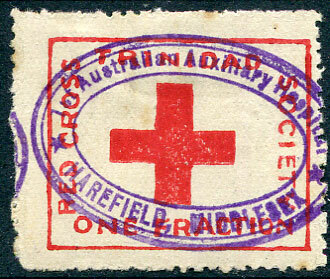 undated in purple ink on 1914 (½d) Red Cross label (SG.157, Cat.£225 used), very minor blemishes. Australian Army patients were treated at the No. 1 Australian Auxiliary Hospital (A.A.H.) at "Harefield Park", Middlesex. The scanned picture shows the Australian corner of Harefield churchyard, containing the graves of 111 AIF personnel and one nursing sister who died of wounds or illness at the hospital. The headstones bear the words "Erected by his comrades" and "ANZAC". arrival dated JUN 9 without year on 1905 2½d Seal (SG.139).